I’ve had these wonderful little chef hat molds, from Belgium, sitting in a box, just waiting. Biding their time, until I am ready to attempt the engineering and culinary challenge of double-sided, hollow chocolate molding. I open the box and stare at them. Darned cute, very detailed. Lots of crevices that will demand that the chocolate be perfectly tempered, so it will flow into all of the places it needs to go, to create the definition – the pleats in the hat. These should be sturdy enough to stand up, when finished, with no extra messy “tails” of chocolate trailing out from the bottoms or sides. They should look like little sculptures. The molds are rigid, polycarbonate, and very well made. There is no hinge on them, but there are two sets of holes, which, will line up the cavities on each mold, perfectly. I will need to put a screw or dowel, through these holes, wide enough to hold them in position and together. Ideally, they should be clamped, but since I want to lay them flat, one on top of the other, and I cannot lay my hands on an ideal clamp at this moment, I opt for a more homespun solution. I drive a tapered chopstick through each of the sets of holes, to the point of resistance, screw it back and forth a few times, then, when they feel securely together, mark a line on the chopstick with a felt pen, and cut each of the skinny ends of the chopsticks, to the depth of what will be the bottom mold, when it is sitting on a flat surface. Make sense? I hope I am being clear. I hate following instruction manuals – which may explain my upcoming challenges! 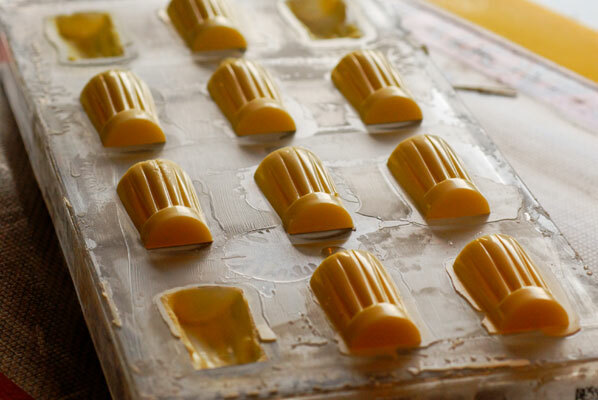 I re-read the hollow hand molding technique thoroughly (so I think) and prepare the chocolate for tempering. 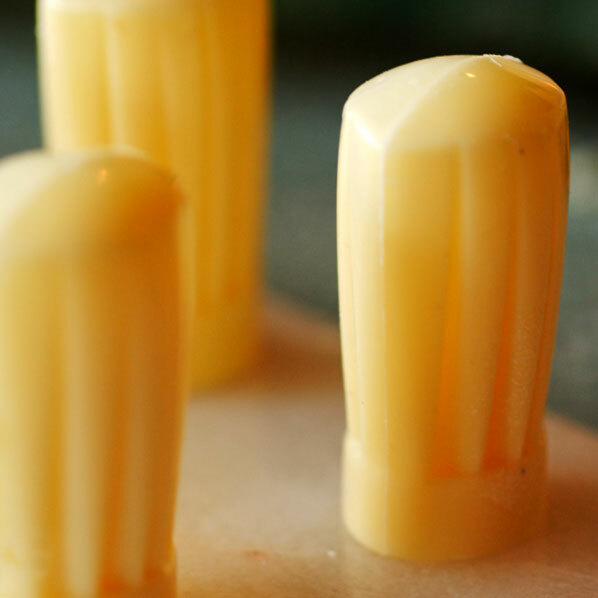 I decide to use white chocolate this time, as I have not played with it, as much as much as milk chocolate and bittersweet, and am eager to see how it will respond to the polycarbonate molds. I chop up one pound of it, with a sharp kitchen knife, and the heady aroma of very good chocolate fills my nostrils, as it curls up under the knife. I have never used the chipper, since my first disastrous attempt, which resulted in a gored pinkie finger. White chocolate has, of course, a much lower melting point, and I stir and watch the mass carefully over my homemade bain marie: large pot of water, colander inside it, large stainless steel mixing bowl inside the colander, slightly smaller mixing bowl, with a wide rim, inside the other one. This set up makes the inner bowl, containing the chocolate easier for me to manipulate, and does, I hope keep the temperature more even and the chocolate less likely to scorch, with the bowl containing the chocolate away from condensation. Out onto the marble slab goes half of the bowl of white chocolate, and it really does not take very long at all to feel the slight pull, which indicates it is in temper range. I want the white chocolate to be 84-86 degrees F, and a quick check with my thermometer indicates that the mass is ready. So, I scrape it all into a clean bowl, add some chocolate from the remainder in the bowl, stir it well, re-check the temperature. My ladle, scraper, spatula, two molds, and chopsticks at the ready, I take a big breath. Co-ordination really is going to be everything. Not for the first time, I wish I had four hands. I get the chocolate into the first mold, and I am already seeing it adhering to the sides. I scrape the top of this mold, and quickly bang the other mold on top. I drive the chopsticks into the holes, and furiously agitate the molds back and forth, trying to get a smooth coverage of both interiors. Unfortunately, I see a gap in several of the “hats”, and no amount of agitation is working to fill in those spots. He chocolate seems to be setting quickly and I have a tough decision to make. 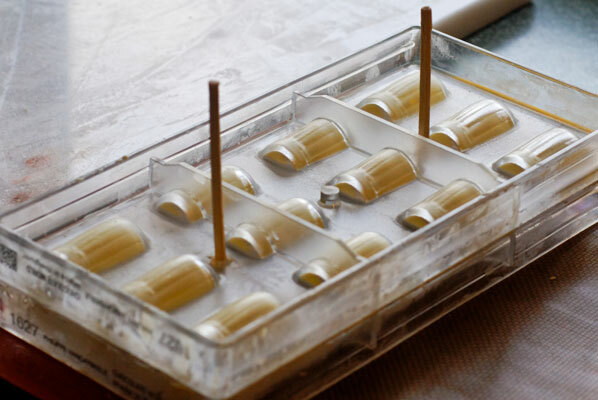 With a sigh of frustration, I remove the chopsticks – they have worked perfectly as clamps, I must say – and insert the scraper between the molds, to pry them apart. I repeat the whole process, including re-tempering the chocolate, and in the mean time, I have another look at the video on the Ecole Chocolate website, and have one of those “lesson learned” moments. Of course. 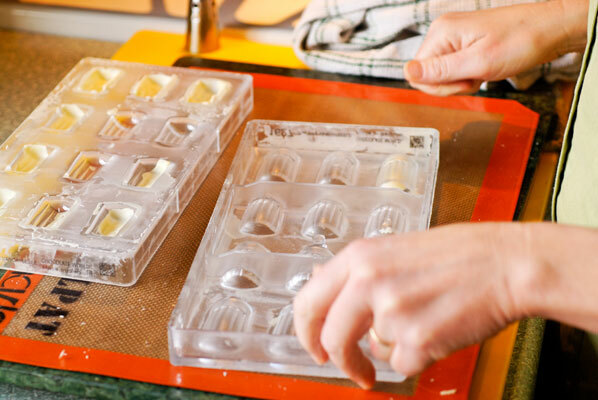 According to Pam’s clear and straightforward instructions on the video, I have to fill both sides of the mold, then quickly place them together and move them around in gentle circles. I simply did not have enough chocolate in the molds for adequate coverage. I have to clean out the molds by carefully picking out as much of the hardening chocolate as I can, with a wooden skewer (so I don’t damage the design), then scrape the stuff clinging to the sides. Upon close examination, I have to admit, there is still enough chocolate in the molds to interfere with any subsequent attempts, and I must wash them out with hot water. This does, unfortunately, wash away the lovely residue of cocoa butter, which would have added gloss to the next batch, but since these are new molds, I am not really losing much. I do think about rubbing the cavities with cocoa butter (I have some in my supplies) but, as usual, I am impatient to rectify my failed attempt – and the chocolate is again, ready. 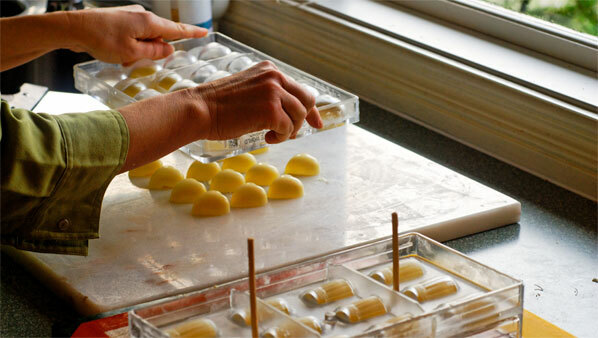 I do get much better coverage, this time, and have enough chocolate left over to make a batch of white chocolate hearts in my favourite mold – the very simple and forgiving heart shape. The molds are consigned to our bedroom marble mantle-piece, on a marble slab, for even cooling. 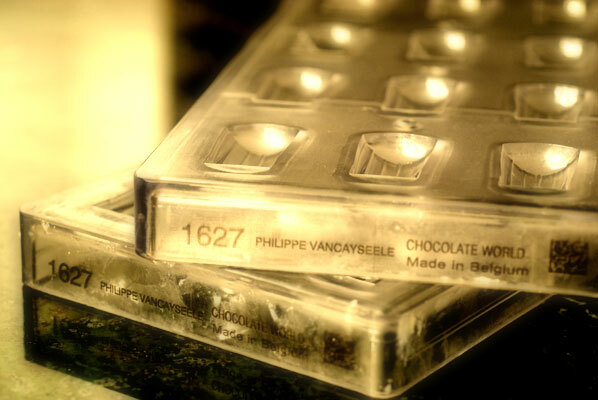 The next morning, the moment of truth, is even more tense-making than the first time I tried unmolding solid chocolates. I check the molds. They appear slightly cloudy – a good sign – it means the chocolate has pulled slightly away from the mold as it dries and contracts. Neither of us hears any “cracking” (also a sign of contracting chocolate) but that could be because we slept through it. I carry them to the kitchen, and hold the mold aloft, ready to whack it down on the marble slab. Fortunately, they do come apart. Not a complete success, as a few of the “hats” have separated into two, but there are several perfect, three dimensional white chocolate chef’s hats on the slab before us. They are well defined, sit up proudly, and make me laugh out loud. A brilliant idea. Perhaps I’ll make a complete set of dark, milk and white, and we can use them in our next round of Pictionary. But for now – we eat them.